Want to know the latest happenings at Collier Elementary? We love sharing good news with you! 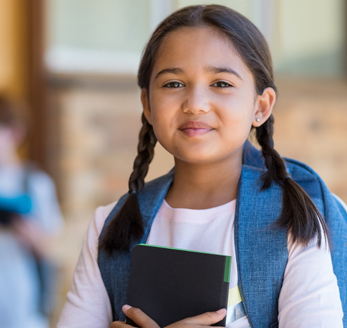 We update this page frequently with school news and events, student awards, and helpful parenting tips. You'll also find our entire monthly newsletter on this page. Happy reading! Littleton Elementary School District #65 presents the 13th Annual Student Art Exhibit from April 18 to May 8. The art exhibit will take place at the Avondale Civic Center Library at 11350 W. Civic Center Drive, Avondale, AZ 85323. There is an art exhibit recognition on April 24, 2019, from 5:00 p.m. to 7:00 p.m. Viewing times are Monday through Thursday from 11:00 a.m. to 7:00 p.m., Friday from 1:00 p.m. to 5:00 p.m., and Saturday from 11:00 a.m. to 5:00 p.m.
Mark your calendars for our 2019 kindergarten round up, happening Thursday, March 21, and Thursday, April 25, from 7:30 a.m. to 7:00 p.m. 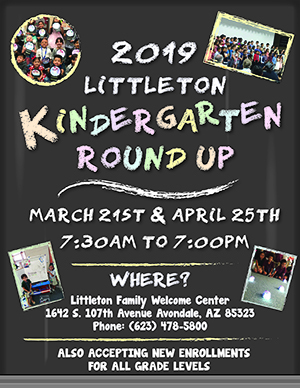 This event will occur at the Littleton Family Welcome Center, 1642 S. 107th Avenue, Avondale, AZ 85323. If you have any questions, please call (623) 478.5800. We are also accepting new enrollments for all grade levels. Missed a newsletter? Don’t worry! You can download our past newsletters directly from our website.